Though it lasted fewer than four years, World War II was the most expensive war in United States history. Adjusted for inflation to today’s dollars, the war cost over $4 trillion and in 1945, the war’s last year, defense spending comprised about 40% of GDP. During that time, the government used new methods to raise the required funds and succeeded in accomplishing its goal. While the wars waged in today’s world are significant and costly, they still pale in comparison to the size and financial impact of World War II. The following infographic, created by Norwich University’s Online Master of Arts in History Program, takes a closer look at the wars of the 21st Century and how they stack up to the wars of our past. Gathering financial facts regarding America’s brief involvement in World War I, historians can see that $334 billion was spent fighting the enemy (an amount adjusted to reflect inflation). That amount rose to $4.1 trillion during the Second World War. The disparity in spending is partially explained by the fact that US soldiers fought for just a year during World War I, while they were actively engaged in fighting during the final 4 years of WW II. 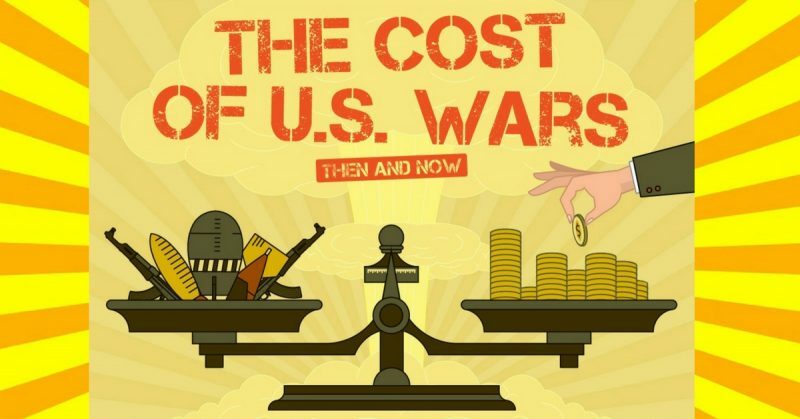 Fifty-five years later, the cost of war has been much less: 1.5 to 1.7 trillion between 2001 and 2014; but the War on Terrorism is stretched out over a much longer period of time. Consider these figures in light of the Gross Domestic Product and budgets as they are established in each generation represented. War spending in the first instance amounts to 14.1% and rises to 37.5% during the Second World War. Defense spending in the past 10+ years, however, has consumed more than 40% of the GDP at its peak. The number of men and women deployed to fight these wars during the same three periods was 4.7M, 12.2M, and 2.5M, respectively. Casualties during those same time periods moved in a similar direction: numbers increased by nearly 400% during WWII over the numbers of men lost 30 years earlier, a figure made up of soldiers, naval officers, air force, and civilians. Those numbers drop significantly when calculating the death toll of America’s War on Terror to less than 7,000 service personnel. There were also 200,000+ people wounded in action during the first conflict while over 52,000 people have been wounded during movements to fight terrorism. That figure is significant: almost 10x the number of professional military personnel killed in action. Men and women have lost limbs, their eye sight, or been maimed in other ways both emotionally and physically, which is perhaps one reason why America seeks funding for their defense budget very differently from the way they sought money for the first two conflicts. War no longer unifies but divides a nation as U.S. citizens lament the many types of loss suffered by their service men and women on a war that has dragged on and on. During the First and Second World Wars, funding came from two sources: bonds and taxes. More than $20 billion was raised to fight with the allies against the enemy during the first conflict for a single year. Raising income tax for the wealthy and selling war bonds covered over 60% of costs and during that time income taxes rose 41% to 72% and 66% to 94% during those two separate periods. Citizens bought $185.7+ billion worth of bonds at 75% face value, set to mature in 30 to 40 years with an estimated 4% profit for each person. Even children bought war stamps to contribute the few pennies they could afford. World War II figures are particularly fascinating as they depict a war fought on the ground, in the air, and at sea using what were considered modern tools of war at the time. They include roughly 13M guns, howitzers, rifles, and carbines combined. Factories built 100,000 tanks, 300,000 aircraft, and manufactured more than 40B rounds of ammunition. Ten battle ships, 27 aircraft carriers, and 200 submarines were built at this time as well. The financial burden was enormous, but patriotic purchases of war bonds had a significant impact on payment of these costs. America’s more recent defense budget has been spent training, arming, and paying men and women to fight. Personnel numbers have expanded; so have costs of wages and benefits to personnel who have retired from active service or been discharged due to disability caused by explosives, exotic diseases, and artillery, often while defending other countries against religious extremists, not defending US citizens. War is unpopular and America’s president is unwilling or unable to seek funding via traditional sources. Almost 150M people filed income tax returns during the war on terrorism compared with 4.4M between 1917 and 1918. Yet, the US has incurred $2 trillion in foreign debt. China is their biggest lender, owed over $1,200 billion.